by Prof. J. J. Thomson, M.A., F.R.S. An abstract of a paper read before the Physical Society. The phenomena of vacuum discharges were, Prof. Thomson said, greatly simplified when their path was wholly gaseous, the complication of the dark space surrounding the negative electrode, and the stratifications so commonly observed in ordinary vacuum tubes, being absent. To produce discharges in tubes devoid of electrodes was, however, not easy to accomplish, for the only available means of producing an electromotive force in the discharge circuit was by electro-magnetic induction. Ordinary methods of producing variable induction were valueless, and recourse was had to the oscillatory discharge of a Leyden jar, which combines the two essentials of a current whose maximum value is enormous, and whose rapidity of alternation is immensely great. 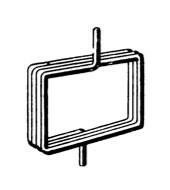 The discharge circuits, which may take the shape of bulbs, or of tubes bent in the form of coils, were placed in close proximity to glass tubes filled with mercury, which formed the path of the oscillatory discharge. The parts thus corresponded to the windings of an induction coil, the vacuum tubes being the secondary, and the tubes filled with mercury the primary. In such an apparatus the Leyden jar need not be large, and neither primary nor secondary need have many turns, for this would increase the self-induction of the former, and lengthen the discharge path in the latter. Increasing the self-induction of the primary reduces the E. M. F. induced in the secondary, whilst lengthening the secondary does not increase the E. M. F. per unit length. The two or three turns as shown in Fig. 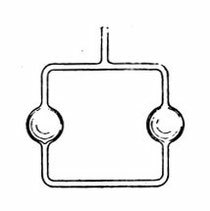 1, in each, were found to be quite sufficient, and, on discharging the Leyden jar between two highly-polished knobs in the primary circuit, a plain uniform band of light was seen to pass round the secondary. An exhausted bulb, Fig. 2, containing traces of oxygen was placed within a primary spiral of three turns, and, on passing the jar discharge, a circle of light was seen within the bulb in close proximity to the primary circuit, accompanied by a purplish glow, which lasted for a second or more. On heating the bulb, the duration of the glow was greatly diminished, and it could be instantly extinguished by the presence of an electro-magnet. Another exhausted bulb, Fig. 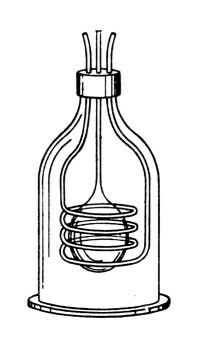 3, surrounded by a primary spiral, was contained in a bell-jar, and when the pressure of air in the jar was about that of the atmosphere, the secondary discharge occurred in the bulb, as is ordinarily the case. On exhausting the jar, however, the luminous discharge grew fainter, and a point was reached at which no secondary discharge was visible. Further exhaustion of the jar caused the secondary discharge to appear outside of the bulb. The fact of obtaining no luminous discharge, either in the bulb or jar, the author could only explain on two suppositions, viz., that under the conditions then existing the specific inductive capacity of the gas was very great, or that a discharge could pass without being luminous. The author had also observed that the conductivity of a vacuum tube without electrodes increased as the pressure diminished, until a certain point was reached, and afterwards diminished again, thus showing that the high resistance of a nearly perfect vacuum is in no way due to the presence of the electrodes. One peculiarity of the discharges was their local nature, the rings of light being much more sharply defined than was to be expected. They were also found to be most easily produced when the chain of molecules in the discharge were all of the same kind. For example, a discharge could be easily sent through a tube many feet long, but the introduction of a small pellet of mercury in the tube stopped the discharge, although the conductivity of the mercury was much greater than that of the vacuum. In some cases he had noticed that a very fine wire placed within a tube, on the side remote from the primary circuit, would prevent a luminous discharge in that tube. Fig. 4 shows an exhausted secondary coil of one loop containing bulbs; the discharge passed along the inner side of the bulbs, the primary coils being placed within the secondary. The HTC One M9+ comes with Android 5.0 Lollipop along with HTC's Sense 7 UI skin on top. Visually, Sense 7 is very similar to Sense 6 but includes some new features including themes that change the complete look and feel of the phone.